I think it was good. I didn't actually meet a team member, but some in my group that picked up and dropped off the keys enjoyed the experience. The experience was wonderful. The condo was much more spacious than expected. The high ceiling and the large windows overlooking the lake and June Mountain were wonderful. We really enjoyed the ample parking right near the condo, which is something that condos in Mammoth don't provide. The bedrooms were really nice and the condo is quite modern. We hope to stay here again next year. When my sister in law lost her keys, the staff was very quick to bring a snow shovel and they even helped look for the keys in the snow! We love the Interlaaken #21! Its a beautiful condo and it has beautiful views. We truly get to relax when we come. Both ladies were very helpful and accommodating. Everybody was super nice and helpful. We all loved the A-frame. Our group discussed renting the property again in the future! Thank you! 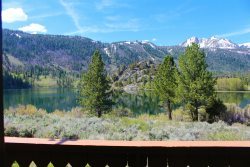 June lake accommodations is great and renting with them is fast and easy. Their properties make for a perfect family snow vacation each year. We had a great stay! Lots of room for 3 families. Clean and warm in the cold weather. Able to cook big meals for lots of people and plenty of dishes and space. Would definitely stay here again. We have enjoyed the June Mt area for numerous years and hopefully the businesses will continue to prosper. A favorite community for our family for several generations. Staff members were friendly and efficient and were able to accommodate exactly what we were looking for. This property was beautiful and full of amenities that made our stay spectacular! We loved the place, the area and the surroundings.... Loved going into town too. The people there were all so friendly and warm. The June lake accommodations team is always so easy to work with and friendly! Everyone on staff was excellent. We had a lovely visit. Beautiful - such a magical vacation at June Lake.